In mid-March 2015 an adult female eastern foxsnake (Pantherophis gloydi, formerly Elaphe gloydi) with signs of dermatitis was accidentally disturbed while hibernating at a location close to Lake Erie in Ontario, Canada. The snake was treated in captivity and samples were submitted to the CWHC because the observed lesions were consistent with Snake Fungal Disease. The presence of the fungus Ophidiomyces ophiodiicola was confirmed by culturing the fungus as well as by Polymerase Chain Reaction (PCR). Snake Fungal Disease was confirmed with histological examination of a full depth skin biopsy. We believe this is the first documented case of Snake Fungal Disease in Canada. The disease has previously been confirmed in 16 U.S. States. Snake Fungal Disease (SFD) is an emerging disease affecting a variety of snake species in eastern North America, including the northern water snake (Nerodia sipedon), eastern racer (Coluber constrictor), rat snake (Pantherophis obsoletus species complex), timber rattlesnake (Crotalus horridus), massasauga (Sistrurus catenatus), pygmy rattlesnake (Sistrurus miliarius), and milk snake (Lampropeltis triangulum). First noted in 2006, the disease varies in severity but has been associated with significant morbidity and mortality in some cases. 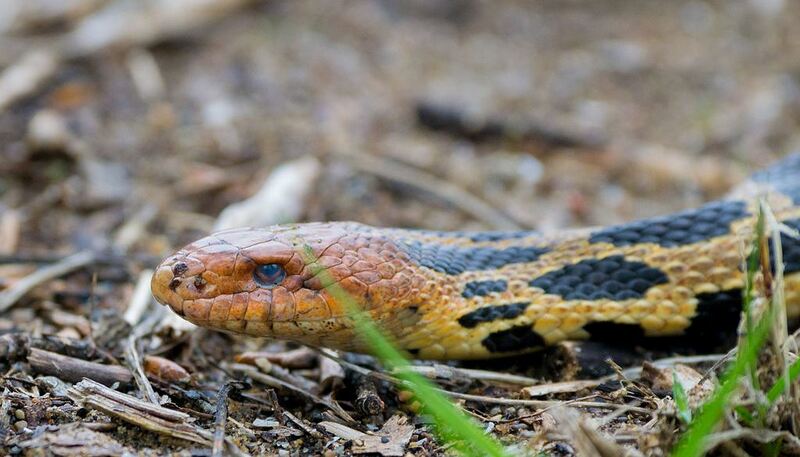 This is cause for concern in Ontario, where ten of our seventeen snake species, including the eastern foxsnake, are already provincially listed as species at risk. Clinical signs of SFD can be severe and can include skin ulcers, invasion of deep muscle tissue and bone and, in rare cases, has been noted to invade the lungs and liver. However, the most consistent signs of the disease are scabs or crusty scales, subcutaneous nodules, abnormal molting, white opaque cloudiness of the eyes that is not associated with molting, or localized thickening or crusting of the skin. In many cases affected snakes exhibit relatively mild signs similar to ‘hibernation sores’. Since first confirmed in Ontario in March 2015, the CWHC has tested 46 more snakes for the fungus, Ophidiomyces ophiodiicola. PCR confirmed twelve (12) tested positive for the presence of the fungus. Snake Fungal Disease has been confirmed by histology in 3 of those snakes (all eastern foxsnakes). Several agencies, researchers and organizations including the CWHC are working together to investigate the distribution and impact of this disease in Canada. We encourage conservation agencies, wildlife managers and members of the public to contact the CWHC if snakes with clinical signs consistent with SFD are encountered. I was talking to a reptile vet from London last fall, and he thought that snake fungal disease had been in Ontario for some time, specifically in snakes around Rondeau Provincial Park. The good news of this is that the vets are encouraging people working with the snakes to use protocols to avoid spreading snake fungal disease. He is likely correct. We can’t confirm the disease was here before 2015 (unless someone has older samples archived somewhere that are suitable for histology and PCR), but there is evidence that the pathogen, O. ophiodiicola, has been in Ontario for at least a few years. You are absolutely right about the value and importance of biosecurity protocols to prevent spreading the pathogen. What is the name of the reptile vet in London? Thanks! Thank you for sharing this. We are currently trying to determine where this fungus is present and which snake species are at risk, so this sort of information is very useful to us. We have had a few reports of queensnakes in Ontario with lesions that look like SFD, but so far we have received no diagnostic samples so we have been unable to confirm. If you see snakes that look like they may be infected please contact the CWHC and let us know (if you can photograph the snake that would be very helpful). We will pass on the information to the agencies, researchers and organizations in the field collecting samples in Ontario this year; reports like yours can help them target their search more effectively. In Ontario you can reach us by phone Toll-Free: 866.673.4781 or by email at on-nu@cwhc-rcsf.ca. I have photos of a milksnake that I found this morning, very lethargic (just out of hibernaculum) and showing a couple of areas of what looked like rotting scales. I’m unfamiliar with “hibernation sores” and would like to send photos to anyone who might help in identification of these lesions. My apologies for the delay in response. You can send your photos to our data and communications officer (me) Dale Jefferson at djefferson@cwhc-rcsf.ca . If you could also identify the area where you took the photographs.